It is a classic salad inspired from Waldorf Salad; although, the dressing does not use mayonnaise but it is a cream base mixture. I give it a tang using some Greek yogurt along with heavy cream. Although not truly low fat, with the apples–tossed in lemon juice–and the cool dressing, this salad tastes singularly light and refreshing. If you want to make it healthier, you can replace the heavy cream with some buttermilk and slightly increase the volume of yogurt. You can use any kind of apples as long as they are crisp. I try to use two kinds–one green and one red, for the color contrast. Coring the apples, unpeeled and then cutting them into thin wedges is the easiest way. If you want a fancier presentation, you may core the apples, cut square the ends and cut the apples into match-size sticks (batonnet). If in season, you may replace one apple with jicama tossed in lemon juice. It offers a nice contrast in texture and is a bit more exotic with an extra tang. If you go to an Asian market, you may find the man pao variety that is slightly sweeter than the Mexican variety. The most common kind of endives is Belgian white, but in winter you may also find the red kind that offers some brighter color. Apples: core them, cut them in thin wedges or batonnets, and toss in a bit of lemon juice to prevent discoloration. If using Jicama version, cut batonnets and toss in lemon juice too. In a different bowl, combine cream, yogurt, and ¼ teaspoon lemon zest. Mix. Toss crumbled gorgonzola in mixture and mix in apple wedges. Salt and Pepper to taste. Toss curly endive/ escarole in a small amount of olive oil just to coat the leaves. 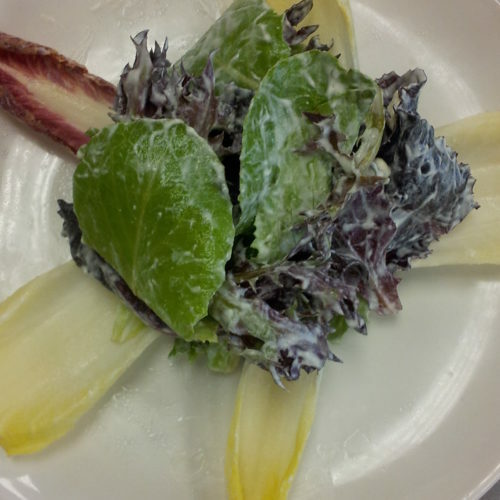 Separate the Belgian endive leaves and garnish each plate with an equal amount–tips toward the rim of the place. At the center, put a bed of curly endive or escarole, and top with apple wedges elegantly and garnish with walnuts. You can make this salad an hour before service and chill it in the fridge for best color and flavors. Jean-Mark Sens grew up in France and Belgium and has been living in the Southern United States of America for the past 25 years, except for a short stint in the deep East of Maine, which brought him back to New Orleans. He has taught culinary arts at the Chef John Folse Culinary Institute down the bayou, Eastern Maine Community College and for Mississippi University for Women on the Gulf Coast, and also worked with the Goldring Centre for Culinary Medicine in New Orleans. He has published a collection of poetry, Appetite, with Red Hen Press. He is currently exploring monastic life at Mepkin Abbey in South Carolina and a candidate for priesthood at Notre Dame Seminary in New Orleans.